Obama and Ted Cruz preside over a dangerous political spectacle. 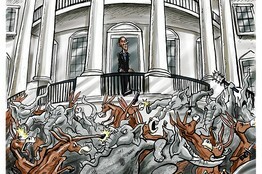 With Washington embarked on another of its oxymoronic shutdowns, everyone is giving it in the neck to the Republicans. So maybe someone should give it to Barack Obama in the knees. He's the president. He wanted this job and must bear some responsibility for what has become of politics in the nation's capital. Which is to say, the obliteration of politics. By choice and disposition, Mr. Obama does not engage in the horse-trading and negotiation that defines Washington's political life. He passed a national entitlement, the Affordable Care Act, without securing any votes by the nation's other party. Readers of Robert Caro's biographies of Lyndon Johnson come away agog at the presidential effort to woo and win opposition votes. On Wednesday the press started to write Where's Waldo? pieces about the president's non-contributions to ending the impasse, so Mr. Obama invited congressional leaders to the White House. They've been there before. The deficit-reduction supercommittee effort of 2011 produced nothing. In fact it collapsed after he became personally involved. But there are consequences to conducting an anti-political presidency, and those consequences are on view now. It has created a destructive vacuum in the political life of Washington. People get themselves elected so they can go to Washington and do politics. These are people for whom politicking is oxygen. If they can't do politics, they start to hyperventilate. They do crazy things. Right now, the Republicans are starting to look like a lab experiment involving gerbils. Cynics and conspirators believe that the ever-clever Obama White House has sucked the oxygen out of the budget negotiations so that the Republicans would shut down Washington, alienate independents and lose the House in 2014. Right now, burning down Washington to resurrect the Pelosi ghosts looks like good strategy. But I don't think this president is that smart. His skills at conducting presidential politics in Washington are minimal. This chaos is the result. There are also consequences beyond Washington when a president is content to forgo governing and let an already fractured Congress become a rabble. Every American who has a stake in the economy improving is being damaged. Tax reform? Forget it. On Wednesday the White House announced Mr. Obama would not make an important confidence-building visit this weekend to Malaysia and the Philippines. The White House planning staff would have (or should have) seen this collision of deadlines coming months ago. So two Asian countries that want to be friends of the U.S. get stiffed, while this headline about Chinese President Xi Jinping appeared in the China Daily: "Xi's visit to lift China-Malaysia ties to a higher level." 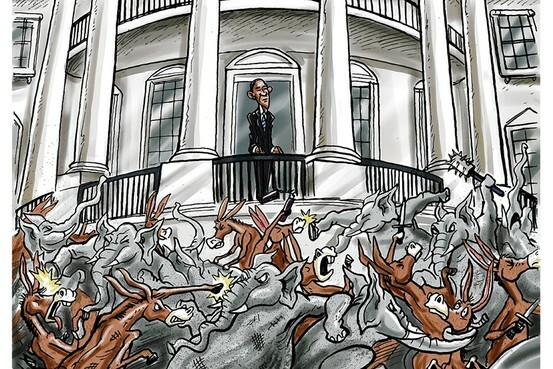 Foreign relations suffer so Mr. Obama can pummel the GOP. Increasingly one can find Democrats who privately admit that the president's minor-league political skills are a liability (the Syrian red-line fiasco). But they ask: How is he supposed to do business with the Barnum & Bailey Republicans in Congress? How can he do a deal with a Speaker who can't deliver the most conservative wing of his own caucus? In National Journal this week, Ron Brownstein offers data to support the view that the number of House conservatives answerable only to themselves has grown significantly. In the 1995 shutdown, 79 Republicans were from districts Bill Clinton carried in the earlier presidential election; Obama last year won only 17 such districts. This may be true, but the political paving over of blue House districts has been known for years. Also known is that the transformation of the Democrats into a European-type public-sector party has created unprecedented divisions over public spending levels. Despite the institutional difficulties, one may still ask whether the responsibility of any president is to let this situation get worse, or to defuse it in the national interest? And it can get worse. The government shutdown may look relatively minor, but the political corrosion on view this week could drive the U.S. into a destructive debt default later this month. That catastrophe is predictable right now, but avoidable, if Mr. Obama will exercise the leadership he was elected to provide. The country Ronald Reagan "inherited" in 1981 was also beset with problems and divisions. The country he left behind after two terms was not. He "negotiated" with the opposition. The productive Ronald Reagan-Tip O'Neill relationship is now the stuff of legend and books. What counterpart has Barack Obama produced? Ted Cruz. With normal political outlets choked off for five years by Mr. Obama, Sen. Cruz and his supporters risk becoming one of the passion-driven, alienated groups that Madison and Hamilton, those famous surrender monkeys, warned against. There was a time when Washington reporters who got into this business for love of politics would have held a president to account for wrecking politics. And did. No more. Instead, they've become mostly thumb-waving spectators in the Roman Colosseum over which Barack Obama presides. Thumbs down any day now for the humiliated John Boehner. It is indeed a spectacle. Absent presidential leadership, it may engulf us all.